The fifth cascade made a refreshing water hole. Our goal today was to get out of the city and see a bit of the Chuquisaca (name of the department) hinterland. In the morning we visited the Fancesa Cement Quarry, which they claim is the largest dinosaur track/footprint site in the world. Years ago the company was digging limestone out of the quarry and they ran into a layer of Magnesium oxide rock which was not used in the cement making process. Two geologists working at the company noticed the fossilized dinosaur tracks. Nadia and I visited the site 15 years ago when there was nothing for tourists and since then, the government has established a visitor’s center with displays and information about the geological time scale and dinosaurs. It is quite an informative center and worth visiting if you want to learn more about dinosaurs. The prints are huge and criss-cross a massive (150 meters high by 1 kilometer in length) slice of rock. It was once a lake and the prints of 4 different dinosaurs can be identified. 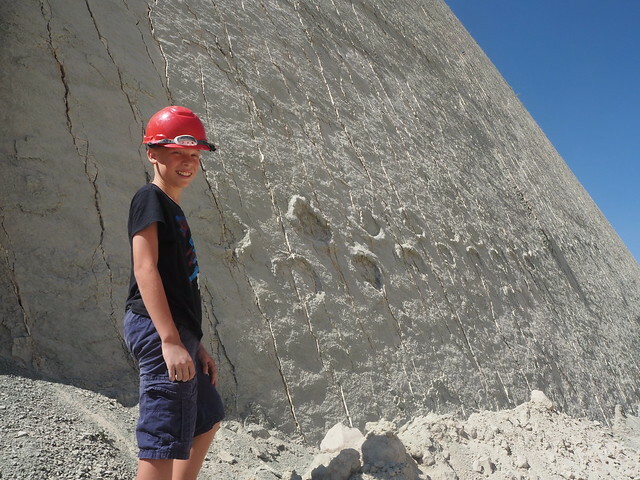 Owen looking at the sauropod prints on the wall of the quarry. 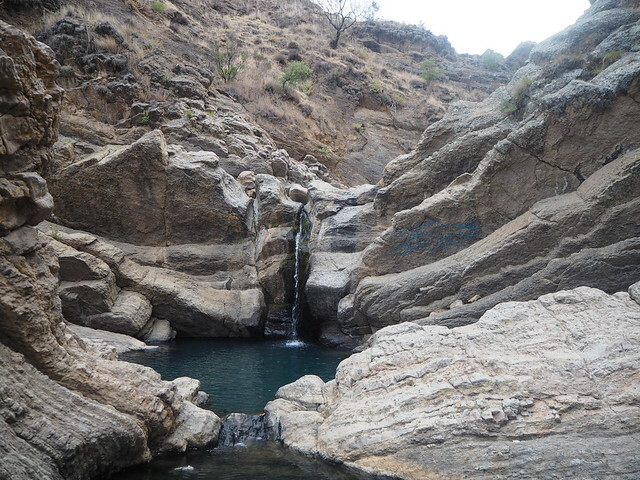 In the afternoon we went on a hike to the Siete Cascadas canyon. It is located past the cement factory in one of the many mountain canyons/valleys in the area. The guide from the hotel was very knowledgable about the local trees. The driver asked me to smoke a cigarette when we got down to the first waterfall to appease Pachamama, the Quechua indigenous god. He said on Tuesdays and Fridays in the month of August it is bad luck to swim in the waters of the river in the canyon without this offering. After a few puffs, Owen and I dove into the blue water and it was cold! 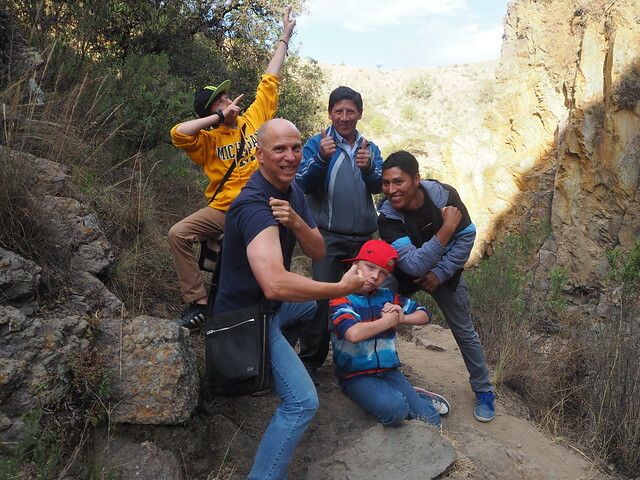 The guide showed the boys a few rock climbing moves and we explored the canyon a bit. We made it over the fifth waterfall, but the sixth and seventh require some serious rock climbing skills. Sadly there was some graffiti and litter at the site, but the rock formations and waterfalls still made it an awe-inspiring site. Ollie leads us out of the canyon. On the way back out, we walked down the river a bit and took a smaller trail back up to the entry road. We saw a freshly killed goat carcass, which the guide said was probably the work of a fox. 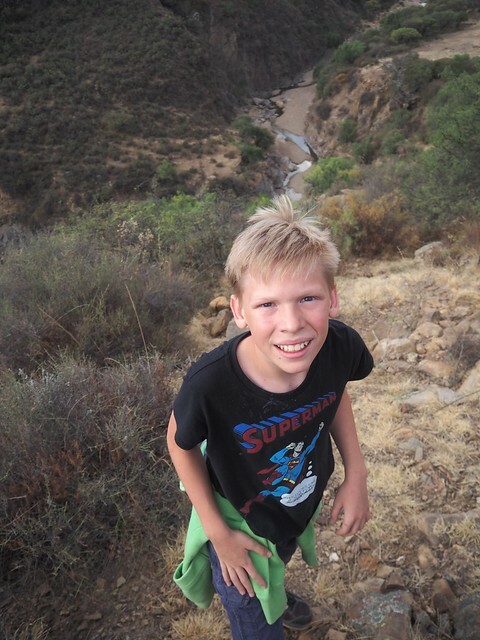 I loved scrambling with the boys through the canyon and the opportunity to get off the regular trail. 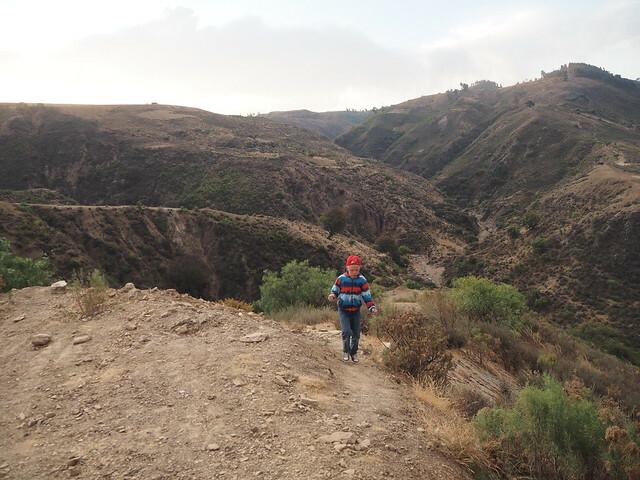 The scenery reminded me a bit of the mesalands of the Venezuelan state of Anzoategui, except it was just a deeper ravine here in the Andes. The access road hugs the side of the cliff and is dirt and it is a bit dodgy with a steep precipice. Our driver was careful going up and down. Sad to see the tough life of the poor of Sucre. The drive back into town went through some very poor barrios. 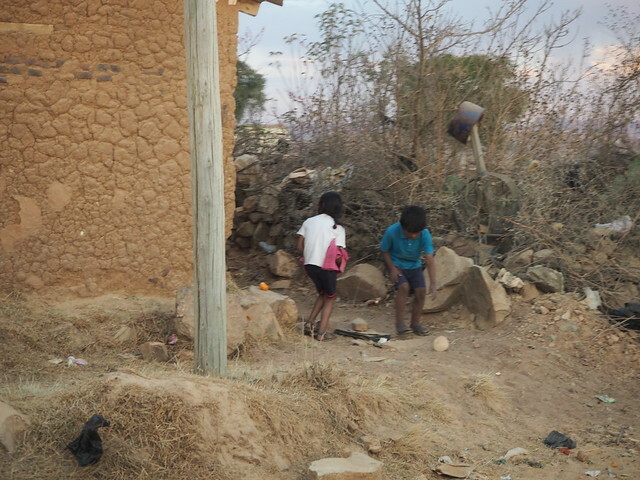 The Barrio Alegria was definitely a misnomer (alegria means happiness in Spanish) as the roads were unpaved, makeshift houses, and disheveled children and garbage in front of the homes. Lots of opportunities for community service up there and I am amazed how people survive in such a tough environment. 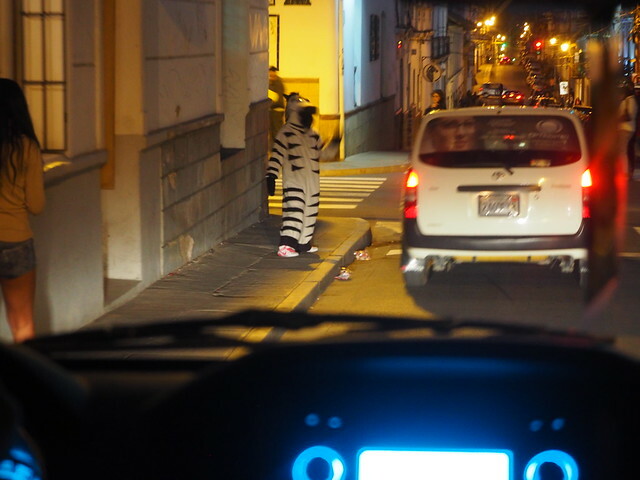 The city has the great idea to use people dressed as zebras to act as crossing guards during rush hour. The colonial streets of Sucre are narrow and there are lots of universities and K-12 schools getting out plus regular pedestrians. At first I thought why zebras, but then figured out the white lines of the pedestrian crossing resemble a zebra. A creative way to keep people safe and add to the character of the city. I can’t wait to explore more of the countryside on Day 3 as we are going for a full day excursion. We finished the day with a walk about the 25 of May Plaza and pizza.